By introducing an entirely new dual-lens camera system in the larger 5.5-inch variant of this year's iPhone upgrade, Apple could struggle with demand for the so-called "iPhone 7 Plus" at launch this fall, one analyst believes. Amit Daryanani of RBC Capital Markets issued a note to investors this week, a copy of which was provided to AppleInsider, discussing features widely rumored for Apple's upcoming "iPhone 7" series. Thanks to growing demand for larger "phablet" screens, he predicts that the "iPhone 7 Plus" will account for one-third of production at launch. Since the introduction of the 5.5-inch form factor with the iPhone 6 Plus, the larger phone has sported a superior camera than its smaller sibling. According to rumors and leaks ahead of the product's launch, the "iPhone 7 Plus" looks to continue that trend. Daryanani believes this year's "Plus" model will feature a dual-lens camera capable of producing DSLR-like image quality. But he also believes the dual-lens camera will be the culprit in limiting availability at launch, with suppliers expected to struggle to keep up with demand at launch. While there are other dual-lens smartphone cameras on the market, Apple's implementation is expected to be a proprietary method based on technology acquired from LinX back in 2015. Supply constraints associated with new technology in Apple products are not new— availability of the Apple Watch was limited for months after it launched in the spring of 2015. Even this year, Apple has struggled to match demand for its entry-level iPhone SE, as the company misjudged how popular the handset would be. Beyond the dual-lens camera, Daryanani's "iPhone 7" predictions echo much of what has been discussed about the upcoming model. He expects it to include an upgraded "A10" processor manufactured by TSMC, improved water resistance, plus faster LTE. Daryanani also believes the "iPhone 7" will ship with a minimum of 32 gigabytes of storage, rather than the current 16 gigabytes. In addition, he also sees the handset including 3 gigabytes of DRAM on the "Plus" model, and possibly even the 4.7-inch base model. Also in line with established rumors, he believes the "iPhone 7" will shed its 3.5-millimeter headphone jack. Looking forward, Daryanani does believe that ever-increasing replacement cycles in the smartphone market will lead to a dip in sales for the calendar year. Whereas the replacement cycle averaged 27 months in 2015, he expects it will extend to 29 months in 2016, and increase even further to 31 months through 2017. In his view, these longer upgrade cycles could lead to a 9 percent year-over-year drop in sales to an estimated 210 million iPhones in 2016. 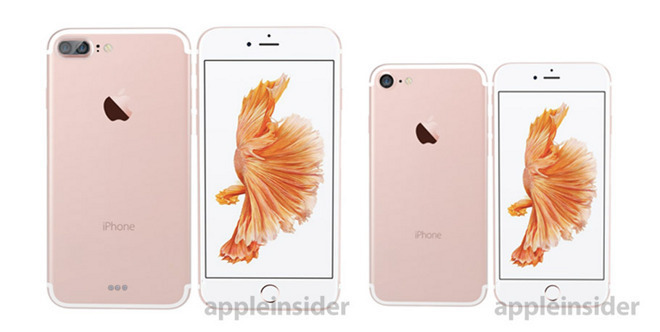 Leaked parts and consensus suggest the chassis of the "iPhone 7" will look largely the same as its predecessors. That has led many on Wall Street, including Daryanani, to predict that this year's model will not match the pent-up demand Apple saw for the iPhone 6 series. Still, RBC Capital Markets has maintained an "outperform" rating for Apple's stock, with a target price of $115 a share. Estimates for the September quarter are $46.9 billion in revenue and earnings of $1.66 per share, which are slightly ahead of Wall Street consensus. Rumors have suggested preorders for the "iPhone 7" will begin on Sept. 9, with the product making its way into the hands of consumers later in the month.